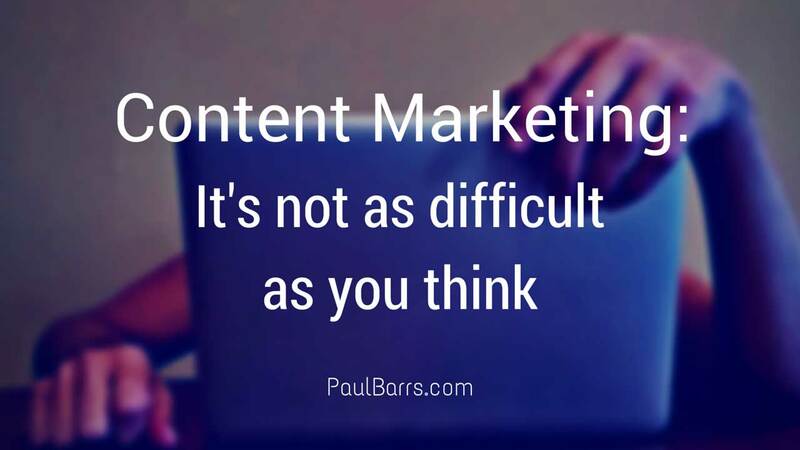 Content Marketing: It’s Not as Difficult as you Think! Home > Content Marketing > Content Marketing: It’s Not as Difficult as you Think! 08 Mar Content Marketing: It’s Not as Difficult as you Think! Today we’re gonna talk about Content Marketing and honestly it’s not as difficult as you think. Hi there! My name is Paul Barrs from PaulBarrs.com. Thank you for taking the time to stop by and watch this video. I’m sure you’ve heard it before, it’s one of those Buzz words last year, this year. The trend is growing, content marketing. Everyone is producing content and pushing it out there. 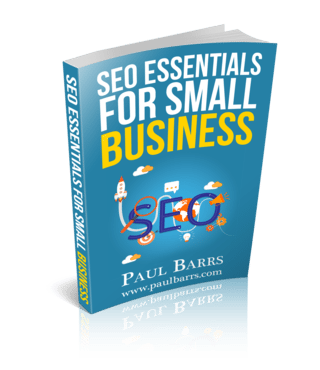 Now it’s such a major part of SEO and rankings as well as social media, as well as newsletters and email marketing. Content marketing that’s it. It’s the business right now. But you read this, you read that, you watch that, you listen to this, it gets a bit overwhelming. Well I’m gonna tell you a very simple system today. This is what I’m doing right now. I’m sitting here at the office I’ve just got a screen here behind me, couple of lights, camera, couple of notes below the camera. I’m recording a video because I like to publish video and yes it is easier for me to talk than it is to type. So I find that’s quite a good thing for me to do. So what I’m gonna do with this particular video once I finish it is I’m going to take a transcript of it. Now, I have two pieces of content – video, transcript. Well, the video of course is going to go to YouTube. You’re probably watching it right there or maybe it’s embedded on my blog. So there I’ve got one piece of content in two different places on YouTube and on my blog. Well, guess where the transcript is also gonna go onto my blog. So, I’ve got the video. It’s up on YouTube. I made a placeholder or a thumbnail image. So I’ll go to somewhere like maybe Canva or I have Photoshop on the computer and okay to use it but Canva’s a good simple tool and I’ll create a nice graphic which becomes that placeholder or that thumbnail image before someone presses play. So, I’ve got the graphic and I’ve got the video and I’ve also got the transcript that’s three pieces of content. You following me here? So the video actually goes up onto YouTube with the placeholder. There’s a link to my blog post once it goes up on there as well. With the video the placeholder of course image shows up with the video it’s just embedded from YouTube and then the transcript. Well see the way my blog is also set up, I need that placeholder image to be the featured image so when it’s shared to social media that’s the image that actually shows up. You with me on that? So now, I have a video, I have a placeholder thumbnail graphic which is good for social media and I have a transcript as well. Three pieces of content going to my, going to YouTube, going to my website’s blog, YouTube’s being shared to social media, blog later at a later date gets shared to social media, I’m also going to send that as summary to my newsletter. Now all I did was what I’m doing right now I’m recording a video. If I wanted to and I’ve done podcasting for many years not doing at present but I could extract the audio. There’s another thing. That’s another piece of content, couldn’t I? Sometimes I’ll work off a list like this one here which has a series of bullet points and I can create an infographic from that, couldn’t I? Sometimes if it’s a really hot topic and I’m getting a lot of interest I might even take the list of something like that and I’ll create a slide for each of them with a slide deck onto SlideShare, couldn’t I? All I did right from the very beginning was record a video, I took a transcript, downloaded the audio, I can make a PDF too if I wanted to, couldn’t I? But what did I do? How did it all begin? Well, actually it began with me sitting down creating a series of lists like that. I made 12 of them. I did them over the weekend having my morning coffee sitting down by the beach. So as I was doing that I wrote out, “Yeah that’s good topic!” Bang, bang, bang, bang. “That’s a good one!” Bang, bang, bang, bang. This is one of them. Here it is right here. Let me grab this, it’s gonna make shake – shake the camera a bit. Didn’t need a bullet point for this because I know this system like the back of my hand. It just says — Outline my current system, video, thumbnail, transcript, MP3, YouTube, blog, newsletter, social media. All I’m doing is recording a video. So I’m now gonna take this video and edit it, that’s that little introduction that you saw at the beginning and I’ll stick that at the end there as well. And then that’s it! I’m done because what I’ve done is put together a system which gets the rest of that done for me and I have clients that I do this for as well. All I need to do is sit down with them for one morning or one afternoon and we produce their content and it’s done! All of it. The lot of it for the next three, four months however long. Could you do this? Of course you could. Takes a bit of time, take a bit of coordination maybe, maybe, maybe it’s not your thing. Okay. If you’re here in Australia give me a call, we’ll do it for you. Show you how to put it together, maybe you do some, we do some. That’s a good idea but you’ve got to do content marketing. It’s not as difficult as you think and it’s essential in today’s business world. Okay folks, that’s it! That’s all I’ve got for today. I hope you learn something from it. Thank you so much for joining with me. Leave some comments, I’d love to hear your thoughts. What are you doing with your content marketing at the moment? Or what would you like to be able to do if you’re not. Leave a thought in the comments below and I’ll talk to you again soon. Bye.